In the past, understanding problems with sleep required overnight stays in hospitals and research facilities. Now, understanding and improving your sleep is as simple as choosing the right bedside alarm clock, such as the new Aura from home health tech giant Withings. The Withings Aura actually consists of two separate devices. 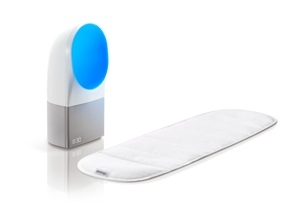 The first is a soft, discrete sensor that slips under your mattress to measure body movement, breathing and heart rate. The second device, an LED lamp and alarm clock, helps monitor your bedroom for external light and noise that may be interrupting your sleep without your knowledge. The information from both is sent to your smartphone to give you a full picture of each night’s sleep. As if the added data wasn’t enough, the Aura aims to improve the quality of your sleep through a few high-tech tricks. You’ll find sound and light programs built in to the device that help relax you to sleep and wake you naturally each morning. There’s even a jet lag recovery program to help reset confused sleep schedules back to normal. The Withings Aura will be available later this spring in retail stores and on withings.com for an MSRP of $299.